Multi-Vendor Hyperlocal Marketplace Plugin for WooCommerce focuses on reaching out to a crowd of a particular area or around that area. This helps to study the temperament and needs of the locales better hence this would be add-on benefit for any business. When planning to establish an e-commerce store, one should focus on targeting a specific mass. Obviously, if the focus is laid on a discrete part of anything, one can achieve extremely productive results. Multi-Vendor Hyperlocal Marketplace Plugin for WooCommerce is based on a similar concept. Using this plugin, users can aim to provide services, completely on the basis of a local approach. This way the business objectives can be met more effectively. Note: Multi-Vendor Hyperlocal Marketplace Plugin for WooCommerce is an add-on to WooCommerce Multi-Vendor Marketplace Plugin. The user must first install WooCommerce Multi-Vendor Marketplace to make use of Multi-Vendor Hyperlocal Marketplace Plugin for WooCommerce. An excellent way to reach out to a generic mob to provide exquisite services. The admin adds multiple locations, based on where the stores are established. The admin creates and configures a shipping area. The admin may activate, deactivate, delete, or edit the ship area. The admin creates a ship area on behalf of the sellers. The admin can create the ship rates on the basis of the shipping area. The admin creates ship rates on behalf of the sellers. 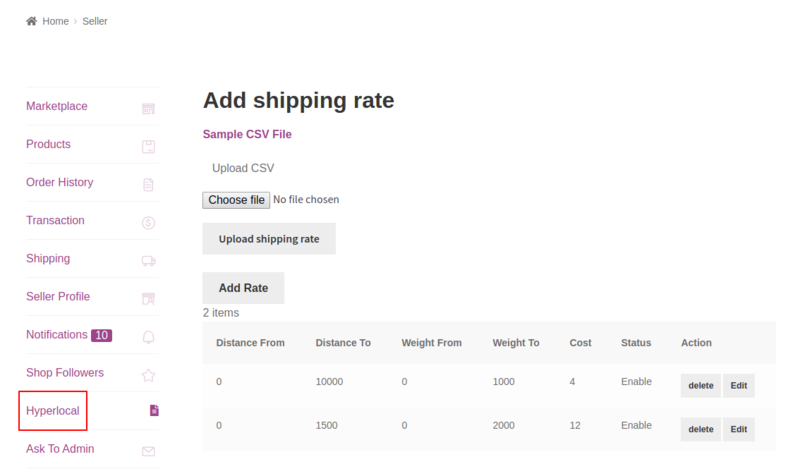 The admin can also upload the CSV files to create ship areas and ship rates. The admin adds radius, distance, and weight units. 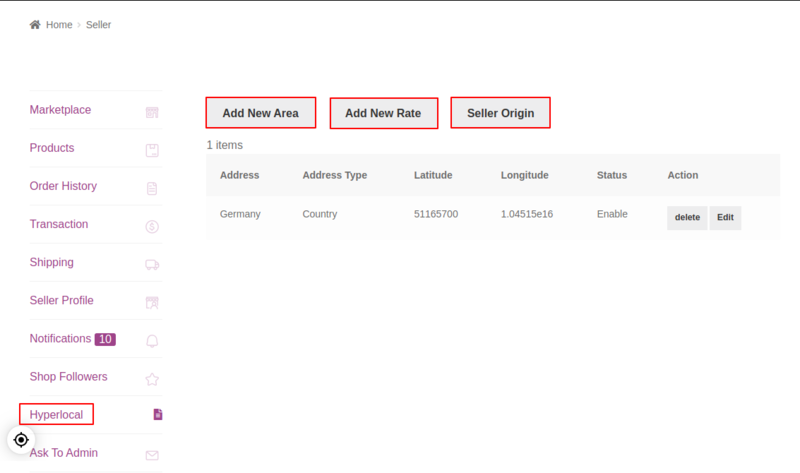 Sellers can create shipping area on the seller panel. Sellers can delete or edit the shipping areas. A sellers origin may be added in the seller panel. 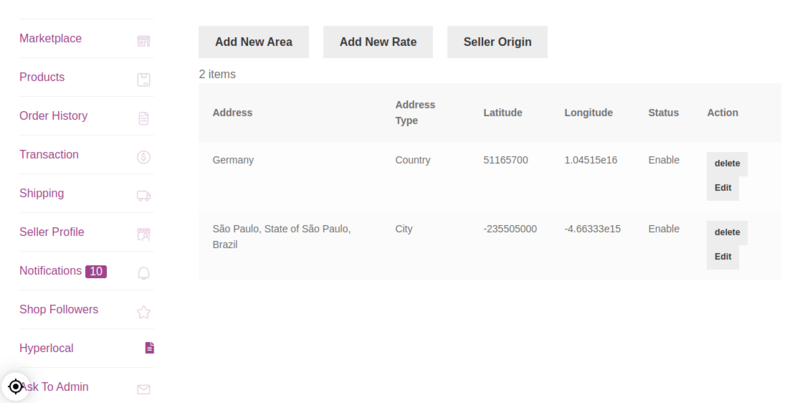 Sellers can add shipping areas or shipping rates through CSV files. Customers can enter a location and buy products from the nearest seller’s store. 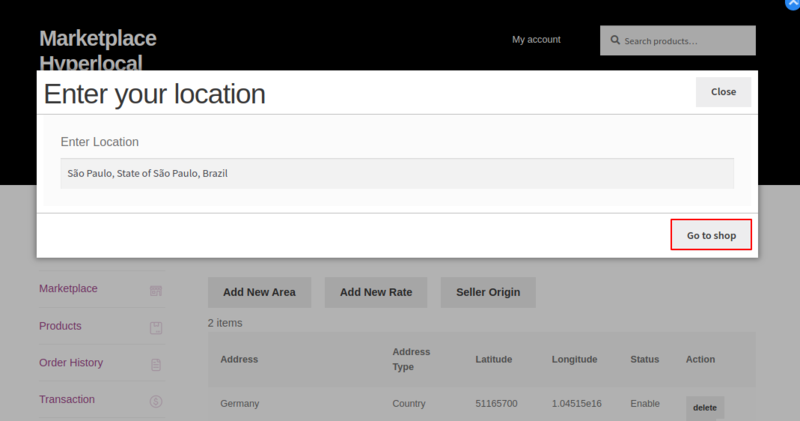 The customer can change the location simply by clicking on the Navigator icon. To configure this module, you will need a geolocation API key. Login in and navigate through API’s and Services > Credentials. The user can click on the New Project to create a new API. The configurations for the new project can be set as shown in the image below. 4.Select ‘API key’ from the list and click on ‘Create Credentials’. So this is how geolocation API key can be obtained and used to configure our module. The admin configures the settings for Marketplace Hyperlocal System at the backend. On clicking the ‘Settings’ option of “Woo Marketplace Hyperlocal”, the admin can set the required details for the user. The configurations are set for the user as shown in the image below. 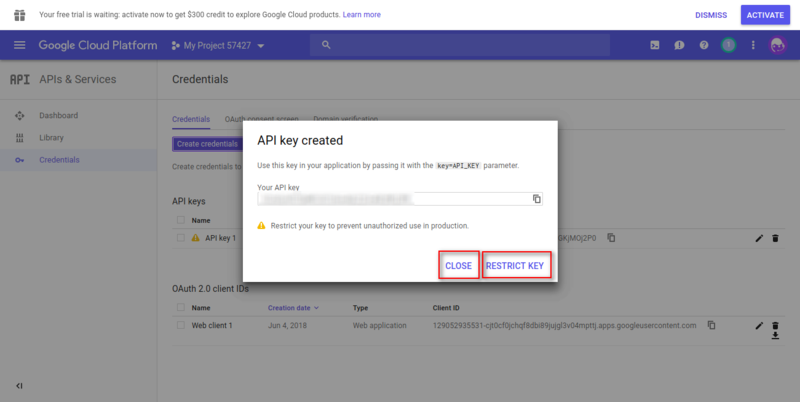 Google api key: Configures the google api key. Heading for Location Pop Up Window: Set a title for the pop-up window that appears at the seller’s end to enter the location. Set Ship Area/ Filter Product on the Basis of: Set the set ship area as either Distance or City, State/Province & Country. Radius Unit: Set the unit, either Mile or Kilometer, to tabulate the radius. Radius: The distance for the radius is set by the admin. Set Default Address: Set a default address for the user. Latitude: The latitude is automatically set as soon as the location is set by the admin. Longitude: The longitude is automatically set as soon as the location is set by the admin. Location Icon Direction: Set the positioning of the location icon by choosing an option from the dropdown list. Enable: Set the status of the Hyperlocal System as enable or disable. 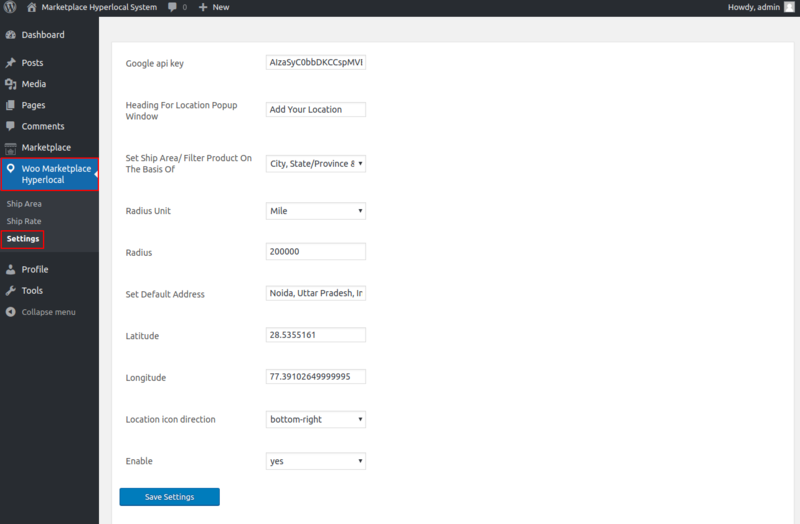 Once the configurations are set for Multi-Vendor Hyperlocal Marketplace Plugin for WooCommerce by the admin, configurations for ‘Ship Area’ and ‘Ship Rate’ are set in the admin panel as shown in the image below. On clicking the Ship Area, the admin can create a new shipping area by clicking on the ‘Add New’ button. Address: Configure the address for the area where products will be shipped. Address Type: Set the address type on the basis of the city, state or country. Latitude: The latitude is automatically set on configuring the address based on the address type. Longitude: The longitude is automatically set on configuring the address based on the address type. Status: Enable or Disable the status of the Shipping Area. Under ‘Ship List Area’, the admin can view the list of Shipping Areas which the admin creates. By clicking on Bulk Actions, the admin can ‘Activate’, ‘Deactivate’ and ‘Delete’ any shipping area. The admin can edit shipping area by hovering the mouse over the seller’s name. Once the admin creates the Ship Area, the Ship Rate settings are configured, on the basis of distance and weight of the products. 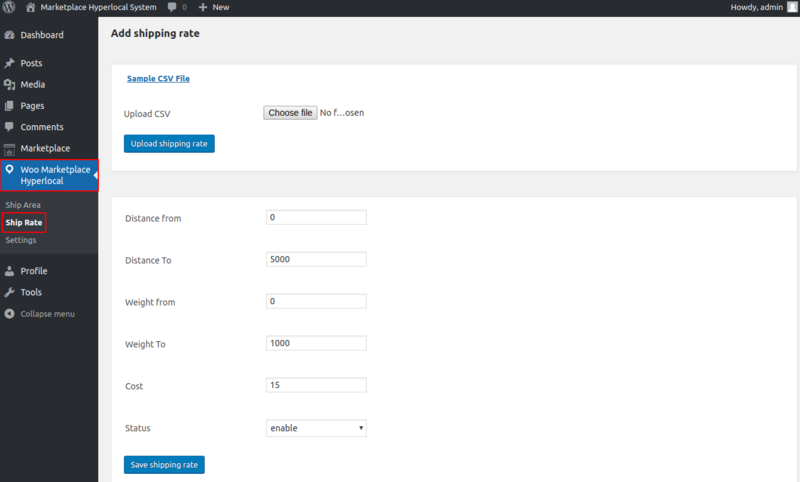 The admin can click on the ‘Ship Rate’ option under the Woo Marketplace Hyperlocal tab in the admin panel. Distance from: The initial value for the distance which is to be covered while shipping the product. Distance To: The final value for the distance which is to be covered while shipping the product. Weight from: The initial value for the weight of the product which will be out for shipping. Weight To: The final value for the weight of the product which will be out for shipping. Cost: Set the cost as per the distance and the weight of the products. Status: Enable or Disable the status of the shipping rate. 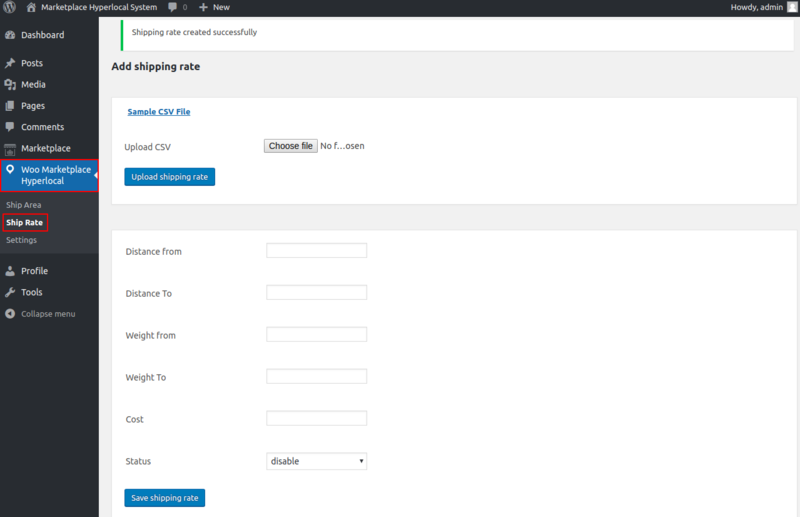 The admin can configure the shipping rates by uploading the CSV files. 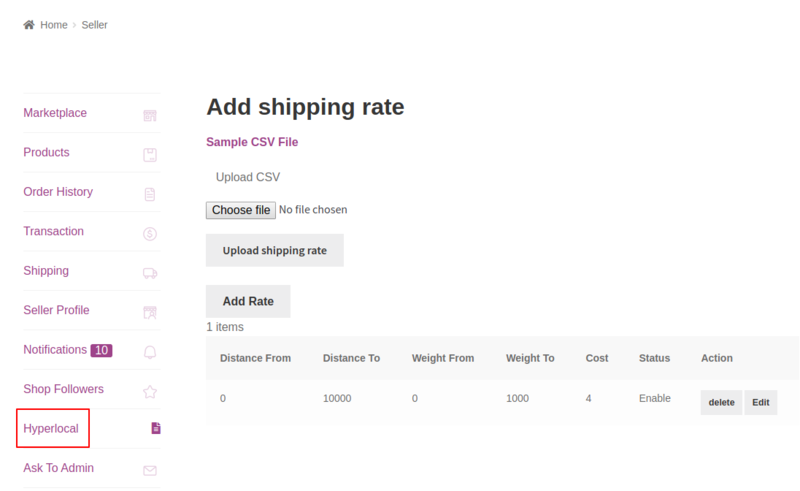 The admin also gets a Sample CSV file and easily upload it to add the shipping rates. 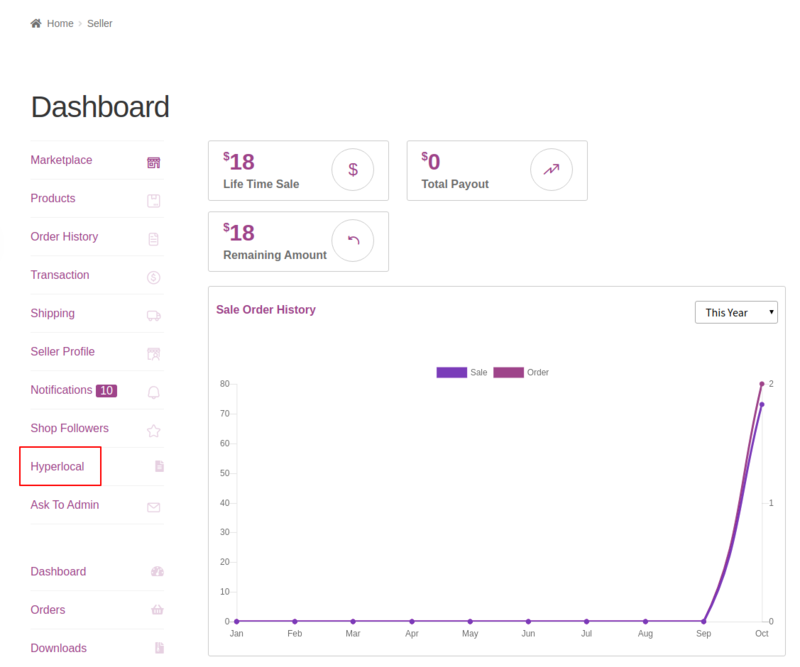 In the seller panel, under the Dashboard options, “Hyperlocal” option is present and seller can configure the settings for Multi-Vendor Hyperlocal Marketplace Plugin for WooCommerce. Under the “Hyperlocal” option, a seller can ‘Add New Area’, ‘Add New Rate’, and set the ‘Seller Origin’. 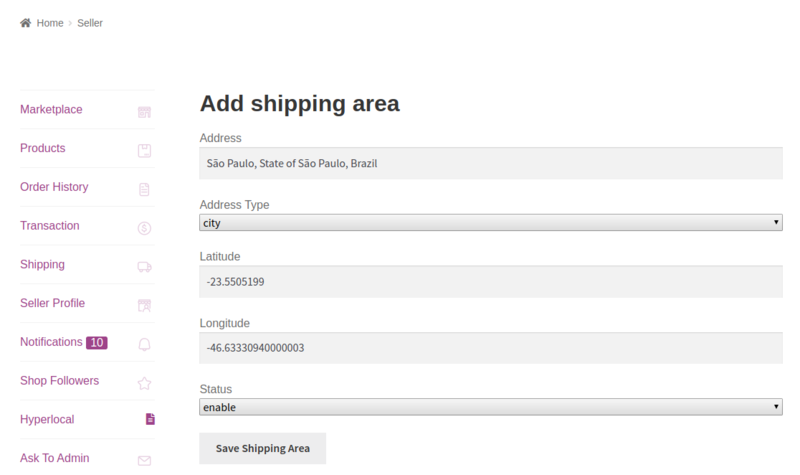 A seller can add a shipping area by clicking on the ‘Add New Area’ and configure the fields required to add the shipping area. Address: Set the address against the ‘Address’ tab by choosing the options which appear on entering a keyword. Address Type: Set the ‘Address Type’ on the basis of a city, state or country. Latitude: The latitude is set automatically as soon as the address is set. Longitude: The longitude is automatically set as soon as the address is set. The shipping areas which the admin creates are present in the form of a list under the ‘Hyperlocal’ option. A seller can add the shipping rates by clicking on the ‘Add New Rate’ tab. Under the ‘Add shipping rate’, by tapping on the “Add Rate” button the seller can configure the settings for the shipping rates. Under ‘Add shipping rate’, a seller can configure the settings for shipping rates. Distance from: The initial value of the distance for shipping a product. Distance To: The final value for the distance for shipping a product. 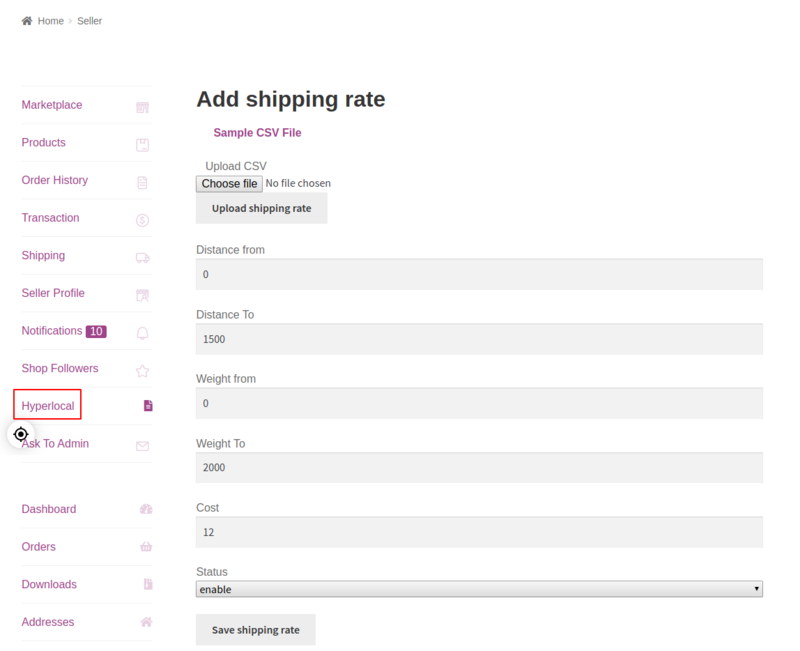 On creating the shipping rate, the seller can view it in the list under ‘Add shipping rate’ as shown in the image below. The seller can also add the shipping origin. 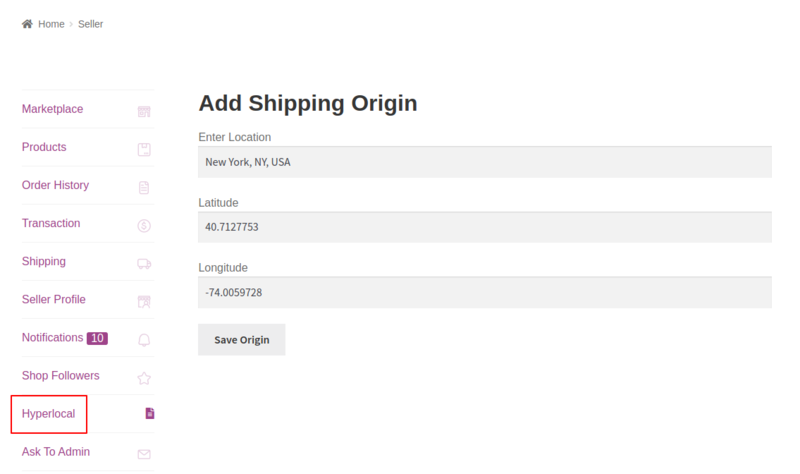 Under the “Seller Origin” tab, the seller can configure the settings for origin under Add Shipping Origin. Enter Location: Add the location of the seller’s store under seller origin. Latitude: The latitude will be set automatically as soon as the location address is set. Longitude: The longitude will be set automatically as soon as the location address is set. When the customer visits the shop page, on clicking the navigation icon, a pop-up appears. The customer has to enter a location. After adding the location, the customer can tap on the ‘Go to shop’ button. 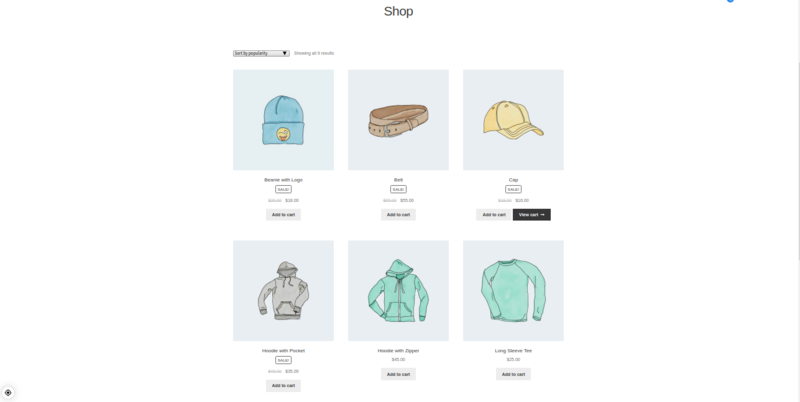 On the product page, only the products which are available for the location which the customer enters will display; the products of other location will not show. On the frontend, the customers can view the products on the basis of the location.